ask.fm to intimidate victims. It can be a particularly difficult problem to address as some online forums may allow bullies to act ann-onymously, impulsively and without constraints on time or place. As such, it is a problem that is confined to neither school nor home. With this in mind, St. Mary’s has launched an awareness campaign among its students to empower, through education, the use of digital technology in a responsible manner. In September, all four first year SPHE classes were given a simultaneous lesson on bullying wherein the various types of bullying were discussed as well as the steps to follow if a student is being bullied or if a student knows of another who is being bullied. The school has put in place a structure of communication involving management, year heads, class teachers, fifth year mentors and the school’s two guidance counsellors. The effect of this is that there is a wide network of responsible adults and senior students who are always available to talk to a student who is being bullied or who knows of a student being bullied. 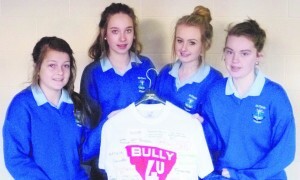 A recent visit to the school from the Bully4u service involved a talk given to all second year students. They gave the girls a one and a half hour workshop on cyberbullying. The workshop involved role-play exercises and audio-visual presentations. The Bully4u speakers, Jim Harding and Kevin Deering, tackled the unique features and impact of cyberbullying. They discussed in detail how students should respond to cyberbullying. The girls were asked to identify words to describe how a victim of cyberbullying might feel. Words such as lonely, sad and scared were printed onto a t-shirt. The t-shirt is currently on display in the canteen as part of the awareness campaign. Each student was given a certificate of participation at the end of the workshop. On Thursday 15th November the school will hold its annual open night. The Principal’s address starts at 7.45pm in the school’s Aemilian Theatre. Parents of current sixth class pupils will, on the night, be given an information poster regarding the safe use of Facebook. The poster will give advice on how parents, teachers, friends and victims should app-roach cyberbullying on Facebook. The poster will also be on display in a number of high profile points throughout the school. Finally, for interested parents, St. Mary’s has published it’s ‘Anti-Bullying Policy’ on the school website.